At the NAC meeting April 8, a resident asked about the proposed gas station at Byte and TJ Drive. Here is the history and update of that issue. 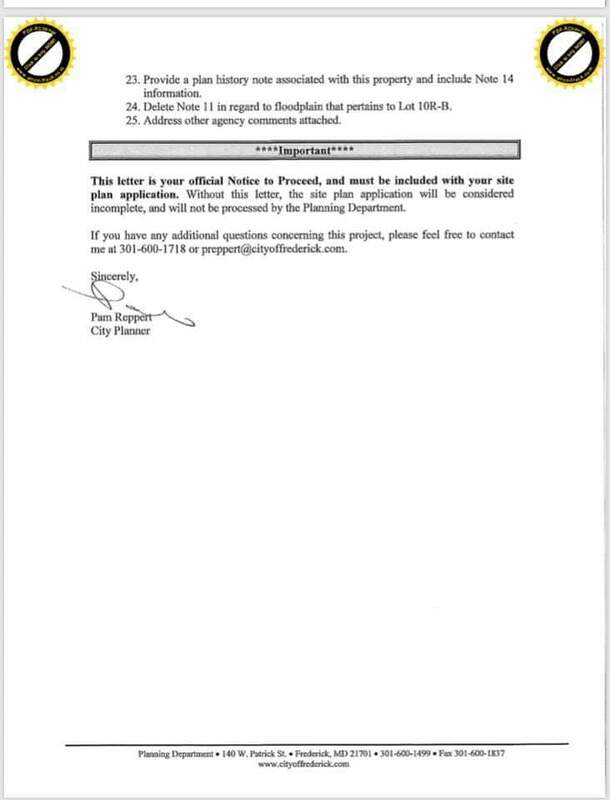 Also attached is the rough sketch "Gas Station Byte Drive" that the developers submitted to Planning for Comment as well as Planning's Review of the Plan with Modifications "Gas Pump Variance Comment Letter." The developers can adjust the plan based on the comments and resubmit. Both Christoper's' Crossing and the Monocacy Route 15 Overpass have been in public plans for years, and the hotel on Byte Drive (Springfield Suites) was approved by NAC 3 two years ago. The newest proposal (summer 2019) is not the hotel, but the add-on of the gas station on the same hotel property, near the homes at North Crossing. 1) A developer came to the NAC 2 years ago, asking to build a gas station at TJ Drive and Byte Drive, but that developer backed out when it learned zoning only allowed them 1 pump (2 nozzles) since the proposed location was close to the forest area and homes at North Crossing. 2) Then another set of developers got a hotel (Springfield Suites) approved by Planning and NAC 3 two years ago, but came back last summer with attorneys before with the Zoning Board of Appeals to request a variance of 6 pumps (12 nozzles) at the same location as the hotel. This request was denied by the ZBA because of the close distance to the North Crossing homes. (NOTE: the Tuscorora stream also runs through the location.) However, the variance was denied because the ZBA stated the request did not agree with the zoning rules in effect about proximity of housing and gas stations. 4) The developers have not yet submitted the revised plan to City Planning. 5) The City Planner has said she will let us know when it is submitted and comes up for discussion at Planning or at a Mayor and Board Workshop. Newer PostNAC 3 Takes Mayor's Assistant Gayon Sampson on Tour!